Peter Ryback married Anna Hansen. Married Name Her married name was Ryback. Anna Hansen married Peter Ryback. Werner Ryback was the son of Peter Ryback and Anna Hansen. Werner Ryback died before November 1998. Emil Koepke married Hulda Gaetzke. Emil Koepke was born in 1875. Married Name Her married name was Koepke. Hulda Gaetzke married Emil Koepke. Hulda Gaetzke was born in 1879. Roland H. Harms was born on 4 February 1926. He was the son of Ernst Martin Christian Harms and Lorena Viola Zimmerman. 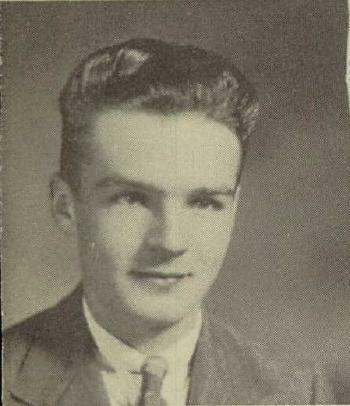 Roland H. Harms married Patricia McMahon on 28 July 1948. Roland H. Harms died on 4 July 2002 at age 76 Roland H. Harms, 76, of rural Ettrick, died on Thursday, July 4, 2002 in his home. Roland was born on Feb. 4, 1926 in Loganville, to Ernest and Lorena (nee Zimmerman) Harms. He married Patricia McMahon on July 28, 1948 in Leland. Patricia preceded Roland in death on April 7, 2001. Roland served his country in the Navy during World War II and was very patriotic throughout his life. He was employed as a machinist and later was a plant manager for Artos Engineering in New Berlin. Roland and Patricia moved to rural Ettrick in October of 1992. Roland was very active in his church and enjoyed hunting, fishing and just being one with nature. Roland is survived by two children, Vicki (Phillip) Nugier, Poynette, and Shane (Geralyn) Harms, Ettrick; four loving grandchildren, Danyelle Nugier, Poynette, Cody, Shana and Ryce Harms, all of Ettrick. In addition to his parents and wife, Roland was preceded in death by a sister, Rosella McLaughlin and a brother, Marvin Harms. Memorial services will be held today, Wednesday, July 10, at 1 p.m. in the Bethel Evangelical Lutheran Church in Galesville with Rev. Nathan Strutz officiating. The family has requested that in lieu of flowers, memorials may be given to the family. The Jack Funeral Home in Blair is assisting the family with arrangements. Married Name 28 July 1948 As of 28 July 1948,her married name was Harms. Patricia McMahon married Roland H. Harms, son of Ernst Martin Christian Harms and Lorena Viola Zimmerman, on 28 July 1948. Patricia McMahon died on 7 April 2001. Married Name Her married name was McLaughlin. Rosella Harms was the daughter of Ernst Martin Christian Harms and Lorena Viola Zimmerman. 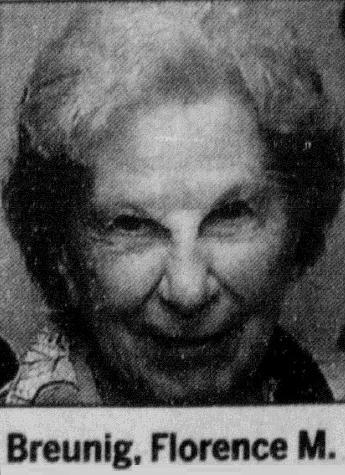 Rosella Harms died before July 2002. Marvin Edward Harms was born on 22 March 1923. Marvin Edward Harms died on 24 August 1989 at age 66. 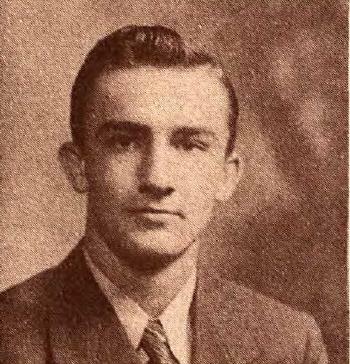 Marvin Edward Harms graduated in 1941 at Reedsburg High School, Reedsburg, Sauk, Wisconsin. Name Variation Cecilia R. Alt was also known as Celia. Name Variation Cecilia R. Alt was also known as Tillie. Married Name 20 September 1938 As of 20 September 1938,her married name was Hemberger. Cecilia R. Alt was born on 5 January 1911 at Wisconsin. She was the daughter of Robert Alt and Anna Frances Ringelstetter. Cecilia R. Alt married Otto Hemberger, son of Ferdinand Hemberger and Anna Margaret Hutter, on 20 September 1938. Cecilia R. Alt died on 3 April 2002 at age 91 Cecilia R. "Tillie" Hemberger, age 91, of Reedsburg, died on Wednesday, April 3, 2002 in the Edward Snyder Nursing Home. She was born on January 5, 1911 in Plain, the daughter of Robert and Anna (Ringlestetter) Alt. On September 20, 1938 she was married to Otto "Snooty" Hemberger. 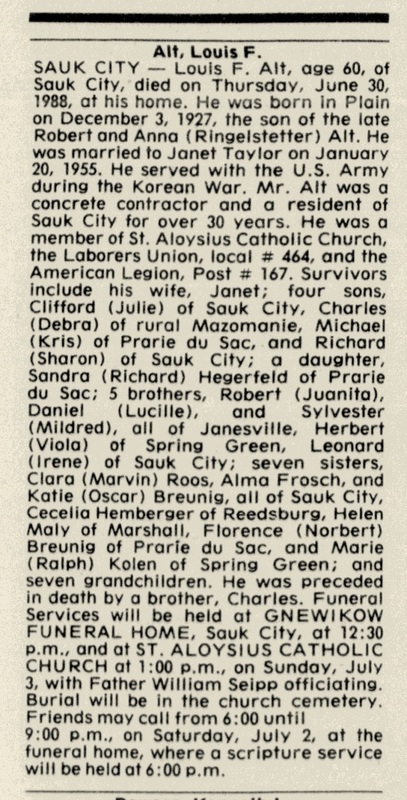 Survivors include four children, Charlotte Koepp of Lake Delton, Darlene (Donald) Mulock of Baraboo, Mary (Dale) Neises of Reedsburg and Tom (Betty) Hemberger; 14 grandchildren; 16 great-grandchildren; 3 great-great-grandchildren; 2 brothers, Sylvester Alt of Janesville and Daniel (Lucille) Alt of Janesville; 6 sisters, Clara (Marv) Roos of Sauk City, Mickey Breunig of Sauk City, Katie Breunig of Sauk City, Alma Frosch of Sauk City, Helen Schulenberg of Sun Prairie and Marie Kolan of Spring Green; many nieces and nephews; other relatives and friends. She was preceded in death by her husband, Otto, on August 18, 1967; a son, Ferdinand; a granddaughter, Sandy Holcomb; and 5 brothers, Leonard, Herbert, Carl, Louie and Robert. A Mass of Christian Burial will be conducted at noon on Saturday at SACRED HEART CATHOLIC CHURCH in Reedsburg with Father Thomas Monaghan officiating. Interment will be in St. Aloysius Cemetery in Sauk City. There will be a visitation from 11:00 A.M. until the time of the service on Saturday at the church. The Hoof Funeral Home is serving the family. [S373] U.S. Federal Census 1940 U.S. Federal Census, by Ancestry.com, Year: 1940; Census Place: Sauk City, Sauk, Wisconsin; Roll: m-t0627-04523; Page: 2A; Enumeration District: 56-35. Name Variation Otto Hemberger was also known as Richard. Name Variation Otto Hemberger was also known as Snooty. Otto Hemberger was born on 20 November 1899 at Wisconsin. He was the son of Ferdinand Hemberger and Anna Margaret Hutter. Otto Hemberger married Cecilia R. Alt, daughter of Robert Alt and Anna Frances Ringelstetter, on 20 September 1938. Otto Hemberger died on 18 August 1967 at age 67. [S245] U.S. Federal Census 1900 U.S. Federal Census, by Ancestry.com, Year: 1900; Census Place: Franklin, Sauk, Wisconsin; Page: 8; Enumeration District: 0134. [S244] U.S. Federal Census 1910 U.S. Federal Census, by Ancestry.com, Year: 1910; Census Place: Franklin, Sauk, Wisconsin; Roll: T624_1736; Page: 6A; Enumeration District: 0115; FHL microfilm: 1375749. [S250] U.S. Federal Census 1930 U.S. Federal Census, by Ancestry.com, Year: 1930; Census Place: Prairie Du Sac, Sauk, Wisconsin; Page: 4A; Enumeration District: 0033. Married Name Her married name was Koepp. Charlotte Ann Hemberger was born on 28 December 1936 at Wisconsin. She was the daughter of Otto Hemberger and Cecilia R. Alt. Charlotte Ann Hemberger died on 3 October 2015 at age 78. Name Variation Sylvester J. Alt was also known as Hezzie. Sylvester J. Alt was born on 19 November 1920 at Wisconsin. He was the son of Robert Alt and Anna Frances Ringelstetter. Sylvester J. Alt married Mildred A. Huppert on 12 August 1947. Sylvester J. Alt died on 28 April 2013 at age 92 Sylvester J. Hezzie Alt, age 92, of Janesville, died on Sunday, April 28, 2013, at home. He was born in Plain, Wis., on Nov. 19, 1920, the son of Robert and Anna (Ringelstetter) Alt. He served in the U.S. Army during World War II from 1942-1946. He married Mildred A. Huppert in Ellsworth, Wis., on Aug. 12, 1947. She preceded him in death on Jan. 13, 2000. Hezzie had previously farmed in Cottage Grove and retired from General Motors after 23 ? years on Jan. 1, 1983. He was a member of St. John Vianney Catholic Church and the UAW Local 95. He was a great fisherman and card player and he loved farming, gardening, the Brewers and the Cubs. 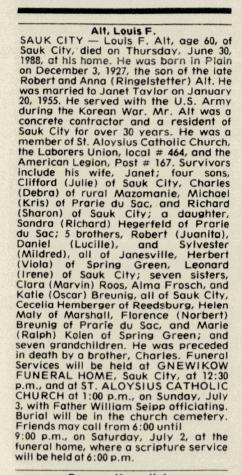 Hezzie is survived by his five children, Dennis (Carol) Alt of Janesville, Laureen (James) Ziech of Kalamazoo, Mich., Bonita (Jim Long) Gable of Tuscaloosa, Ala., Bruce (Lori) Alt of Janesville, and David (Connie) Alt of Janesville; 14 grandchildren; 13 great-grandchildren; brother, Daniel (Lucille) Alt; and two sisters, Alma Frosch and Katie Breunig. He was preceded in death by his parents; wife; five brothers, Herbert, Leonard, Louis, Robert and Charles; and five sisters, Marie Kolan, Florence Breunig, Clara Roose, Helen Schullenburg and Celia Hemberger. A Mass of Christian Burial will be celebrated at 10:30 a.m. on Thursday, May 2, 2013, at ST. JOHN VIANNEY CATHOLIC CHURCH with the Rev. Randy Timmerman officiating. Entombment will be in Mount Olivet Mausoleum. A visitation will be held on Wednesday from 4 p.m. until 7 p.m. at SCHNEIDER APFEL SCHNEIDER & SCHNEIDER FUNERAL HOME & CREMATORY. Daniel G. Alt was born on 4 December 1928 at Wisconsin. Daniel G. Alt died on 2 April 2018 at age 89 Daniel George Alt, age 89, of Janesville, passed away on Monday, April 2, 2018, at home surrounded by his family. He was born on December 4, 1928, the son of Robert and Anna (Ringelstetter) Alt. He served his country in the Army during the Korean War from 1947 until 1951, he also served in the Army Reserves after leaving active duty. He married his wife on August 16, 1952 at St. Aloysius Church in Sauk City, WI. Daniel worked as a Journeyman Plumber at General Motors for 30 years until his retirement in May, 1991. He was a member St. John Vianney Catholic Church, UAW Local 95, Moose Lodge 197 and the American Legion Post 0205. He enjoyed watching the Green Bay Packers and the Wisconsin Badgers. He enjoyed fishing, hunting, woodworking, gardening and playing cards with relatives and friends. Daniel was a “Jack of All Trades”, always helping others in need of home repairs. He is survived by his wife; 5 children; 5 grandchildren; 5 great-grandchildren; sister; and sister-in-laws. He was preceded in death by his parents; 6 brothers: Herbert, Leonard, Sylvester, Charles, Louis and Robert; 6 sisters: Cecelia, Clara, Mathilda, Catherine and Helen. A Mass of Christian Burial will be held at 11:00 a.m. on Friday, April 6, 2018, at St. John Vianney Catholic Church Janesville with Fr. Paul Arinze officiating. Entombment will follow at Mt. Olivet Cemetery with Full Military Honors. Visitation will be held on Friday, April 6, 2018, from 10:00 a.m. until the time of mass at the church. In lieu of flowers, memorials may be made to Agrace Hospice, Disabled Veterans or Wounded Warriors. Whitcomb-Lynch Funeral Home. Married Name 11 August 1936 As of 11 August 1936,her married name was Roos. Clara Margaret Alt was born on 27 November 1914 at Wisconsin. Clara Margaret Alt married Marvin Joseph Roos on 11 August 1936. Clara Margaret Alt died on 13 October 2009 at age 94 Clara Margaret Roos, age 94, passed away on Tuesday, Oct. 13, 2009, at Maplewood of Sauk Prairie. She was born in Plain on Nov. 27, 1914, to Robert and Anna (Ringelstetter) Alt. She was united in marriage to Marvin Joseph Roos on Aug. 11, 1936. Clara grew up in Plain, and loved helping on the home farm, from taking care of the chickens to plowing the fields. At 16, she helped on her brother Herb's farm near Sauk City. Later she worked in Sauk City and it was in Sauk at the Riverside Dance Hall that she met Marvin at a wedding dance. They owned a farm on Lueders Road in Sauk for several years and it was there that she again enjoyed raising and taking care of chickens. Clara also enjoyed crocheting hundreds of beautiful doilies and as many know, they have received some of these over the years and remember the love that went into each one. She was a giving person, and since being a resident at Maplewood, loved to give apples and candy almost daily to the great people who cared for her. She loved everyone and was so thankful for all the wonderful care, love and hugs she received every day. Clara loved it when great-grandchildren would bring their art work into her. She would always make sure they were put on her bulletin board along with her many pictures, for her to see every day and think of the love that went into each one. She is survived by two daughters, Shirley (Fred) Kalsow of Mazomanie, and Carol (Theron) Hill of North Freedom; daughter-in-law, Velma Roos of Corpus Christi, Texas; seven grandchildren, Mike (Nancy) Kalsow of Black Earth, Jeff (Tammy) Kalsow of Mazomanie, Chris (Tara) Hill of Arena, Lisa (Greg) Ziech of Loganville, Deanne (Ron) Kincaid of South Carolina, David Roos of Tennessee, and Daryl Roos of Hawaii; 16 great-grandchildren, Jeremy and Ryan Kalsow of Black Earth, Isaac, David, Katya, Vika and Lyosha Kalsow, Sarah, Cassie and Cody Kincaid, Destiny, Dawson and Daelyn Hill, Dallas Ziech, and Dominic and Marvin Lee Roos; five sisters, Marie Kolan, Alma Frosch, Katie Breunig, Mickey Breunig and Helen Schulenburg; two brothers, Hezzie and Danny Alt; a very special sister-in-law, Carolyn Schwarz; and nieces, nephews, other relatives and friends. 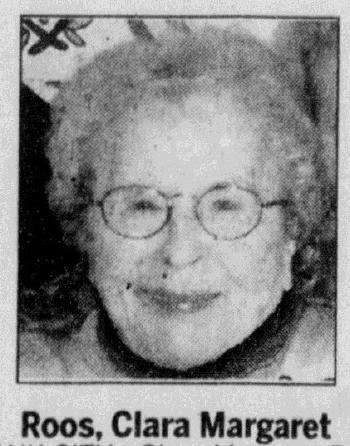 In addition to her parents, she was preceded in death by her "sweetie" husband of almost 73 years, Marvin on June 14, 2009; two sons, Marvin "Bud" and Steve Roos; and several siblings. A Mass of Christian Burial will be held at ST. ALOYSIUS CATHOLIC CHURCH, Sauk City, at 11:30 a.m. on Friday, Oct. 16, 2009, with Father Alex Navarro officiating. Burial will be in St. Aloysius Cemetery. Friends may call at HOOVERSON FUNERAL HOME, Sauk City, from 5 p.m. until 7 p.m. on Thursday, Oct. 15, 2009, and also at the funeral home on Friday morning from 10:30 a.m. until 11:15 a.m. Words cannot express all the thanks and appreciation we have for Dr. Koch for his many years of caring for Mom and Maplewood of Sauk Prairie, for their wonderful loving care and supportive staff who have also been like family. Also, thank you to our dear friend Sharon Evert, who was like a daughter to Mom with her many visits, hugs and love. Great memories and we love you all!! Name Variation Marvin Joseph Roos was also known as Marv. Marvin Joseph Roos married Clara Margaret Alt, daughter of Robert Alt and Anna Frances Ringelstetter, on 11 August 1936. Marvin Joseph Roos died on 14 June 2009. Name Variation Florence Alt was also known as Mickey. Married Name Her married name was Breunig. Florence Alt married Norbert Breunig. Florence Alt was born on 8 February 1922 at Wisconsin. Florence Alt died on 16 December 2010 at age 88 Florence (Alt) Breunig obituary. Norbert Breunig married Florence Alt, daughter of Robert Alt and Anna Frances Ringelstetter. Name Variation Catherine Alt was also known as Katie. Catherine Alt married Oscar Breunig. Catherine Alt was born in 1923 at Wisconsin. Catherine Alt died in 2014. Oscar Breunig married Catherine Alt, daughter of Robert Alt and Anna Frances Ringelstetter. Married Name Her married name was Schulenberg. Married Name before 1965 As of before 1965,her married name was Wipperfurth. Married Name before 1965 As of before 1965,her married name was Wipperlurth. Married Name before 1988 As of before 1988,her married name was Maly. Helen Alt was born in 1926 at Wisconsin. Helen Alt married James Wipperfurth before 1965. Helen Alt married (?) Maly before 1988. Helen Alt died in 2011. Married Name 3 November 1940 As of 3 November 1940,her married name was Windmeiser. Married Name 2 May 1951 As of 2 May 1951,her married name was Kolan. Marie Alt was born on 9 October 1916 at Wisconsin. Marie Alt married Louis M. Windmeiser on 3 November 1940. Marie Alt married Ralph E. Kolan on 2 May 1951. Marie Alt died on 15 August 2012 at age 95 Marie Kolan, age 95, of Spring Green, passed away following a short illness on Wednesday, Aug. 15, 2012, at Greenway Manor in Spring Green surrounded by her loving family. She was born on Oct. 9, 1916, the daughter of Robert and Anna (Ringelstetter) Alt. Marie was married to Louis M. Windmeiser on Nov. 3, 1940, and he preceded her in death on May 22, 1948. She was then married to Ralph E. Kolan on May 2, 1951, and he preceded her in death on Jan. 21, 1998. 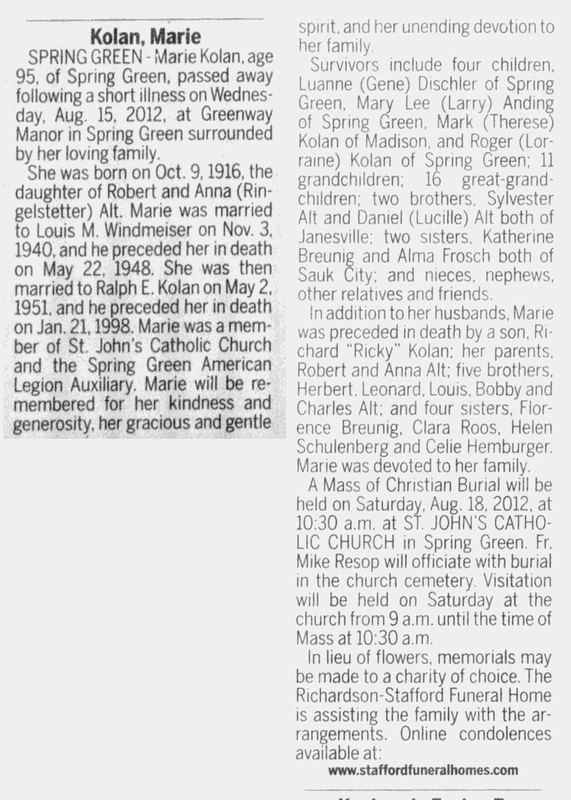 Marie was a member of St. Johns Catholic Church and the Spring Green American Legion Auxiliary. Marie will be remembered for her kindness and generosity, her gracious and gentle spirit, and her unending devotion to her family. Survivors include four children, Luanne (Gene) Dischler of Spring Green, Mary Lee (Larry) Anding of Spring Green, Mark (Therese) Kolan of Madison, and Roger (Lorraine) Kolan of Spring Green; 11 grandchildren; 16 great-grandchildren; two brothers, Sylvester Alt and Daniel (Lucille) Alt both of Janesville; two sisters, Katherine Breunig and Alma Frosch both of Sauk City; and nieces, nephews, other relatives and friends. In addition to her husbands, Marie was preceded in death by a son, Richard Ricky Kolan; her parents, Robert and Anna Alt; five brothers, Herbert, Leonard, Louis, Bobby and Charles Alt; and four sisters, Florence Breunig, Clara Roos, Helen Schulenberg and Celie Hemburger. Marie was devoted to her family. A Mass of Christian Burial will be held on Saturday, Aug. 18, 2012, at 10:30 a.m. at ST. JOHNS CATHOLIC CHURCH in Spring Green. Fr. Mike Resop will officiate with burial in the church cemetery. 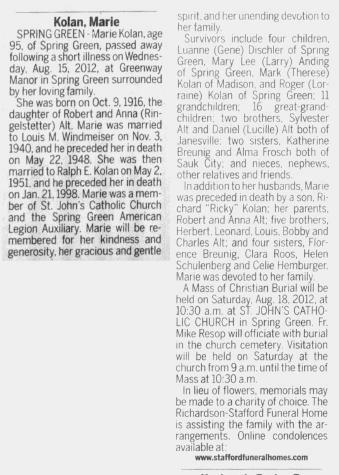 Visitation will be held on Saturday at the church from 9 a.m. until the time of Mass at 10:30 a.m.
Ralph E. Kolan married Marie Alt, daughter of Robert Alt and Anna Frances Ringelstetter, on 2 May 1951. Ralph E. Kolan died on 21 January 1998. Ferdinand R. Hemberger was born on 30 December 1939. He was the son of Otto Hemberger and Cecilia R. Alt. Ferdinand R. Hemberger died on 21 January 1941 at age 1. Leonard Alt was born on 1 November 1912 at Wisconsin. Leonard Alt married Irene Mathilda Pronold, daughter of Anton Pronold and Lillian Hemberger, on 27 July 1937. Leonard Alt died on 28 February 1994 at age 81. Herbert Alt was born in 1909 at Wisconsin. Herbert Alt married Viola A. Pronold, daughter of Anton Pronold and Lillian Hemberger, on 14 April 1934. Herbert Alt died on 10 April 1996. Name Variation Carl Alt was also known as Charles. Carl Alt was born in 1924 at Wisconsin. Carl Alt died in 1949. Name Variation Louis F. Alt was also known as Louie. Louis F. Alt was born on 3 December 1927 at Wisconsin. Louis F. Alt married Janet Taylor on 20 January 1955. Louis F. Alt died on 30 June 1988 at age 60 Louis F Alt obituary. (?) Hinrichs was born before 1864 at Germany. He was the son of George Hinrichs and Katherine Dorothea Harms. (?) Hinrichs died before 1866 at age 2.